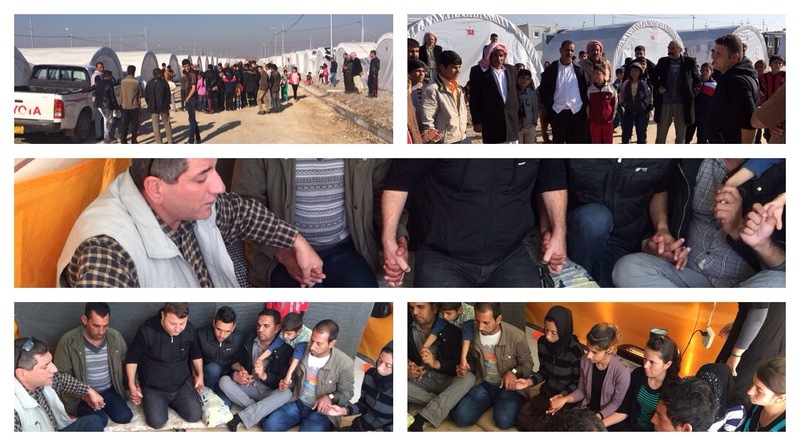 Pastor Layth has been working in the Refugee Camps as well as helping large numbers of IDPs scattered throughout Duhok. Those who are coming to Christ in the camps are mainly from Sinjar; where the Yezedis were trapped by ISIS for months atop Mt. Sinjar. Those who escaped made their way through great danger, traveling mostly on foot through ISIS occupied territory to Kurdistan for safety. The majority of those responding are young people; men, women and families. All who respond are eager to hear the Gospel. Their world has been severely shaken and damaged. Pastor Layth has been working to bring them new hope and fresh direction. There are now three different groups in the camps. He’s training them to share their faith with others in the camps as well as for the day when they can return to their homes taking the Gospel of Peace with them. THERE IS AN UNPRECEDENTED RESPONSE COMING OUT OF THIS CRISIS JUST AS WE SAID THERE WOULD BE. WE NEED YOUR SUPPORT TO CONTINUE ON. THIS IS THE SEASON AND WE NEED TO REAP WHILE THE HARVEST IS RIPE. Please take a moment to visit our donation page and get involved today.